Whisk the egg whites with salt and granulated sugar until it gets fluffy consistency. Butter the baking paper and sprinkle with almond flakes or coconut, pour on it the white mass and spread it to receive a thin cake (ca. 1-1,5 cm). Afterwards put it into the up to 200 °C preheated oven for ca. 8 minutes (the meringue can not get dry). The baked and worm meringue cake remove from the oven, turn it around and lay from top side on the baking paper sprinkled with powdered sugar. Remove gently the baking paper on which the meringue was baked and which is now lying on top. Put the meringue cake aside to chill. 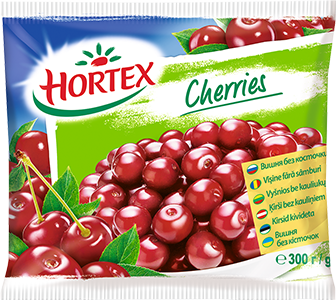 Afterwards pour the cherries in a hot pan. Wait until they melt and add powder sugar. Put aside to chill and stir to jam. Whisk the cream with vanilla sugar to dense mass. Lay on meringue cake the whisked cream and on top put the cherry jam. Roll it in a roulade (use therefore the baking paper). 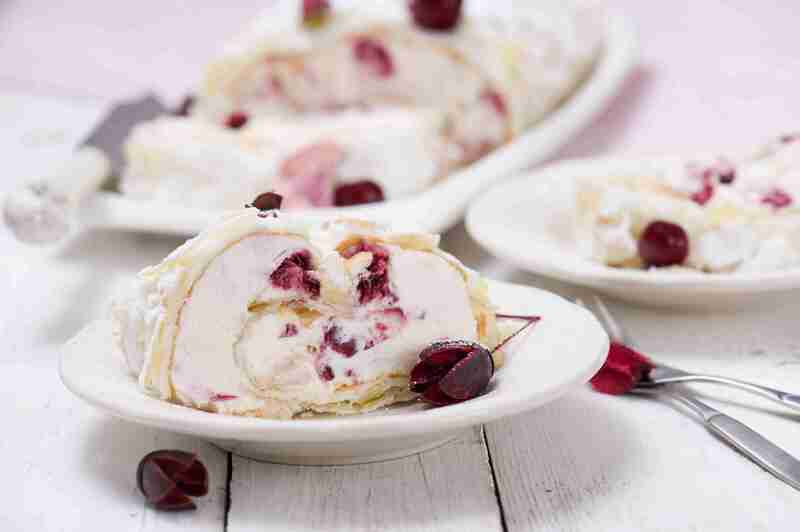 Place the roulade for a short while in the refrigerator so that all tastes can combine with each other. Serve chilled.